On a typical work day for Sai,* she could walk miles of city blocks with her shop on her shoulders. Her hopes of a meal for the day depend on emptying the two baskets dangling from a bamboo pole. Like many in large cities, Sai operates a portable store, selling anything from drinks and cigarettes to fresh fruit and spring rolls. Street vendors like Sai work long hours and have difficult lives. Pray for street vendors in Vietnam to find the provision and love offered in a relationship with Christ. 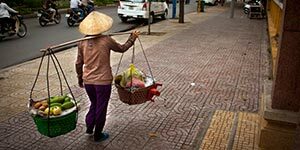 Pray for Christians in Vietnam to take every opportunity to show love and share the message of salvation with street vendors.